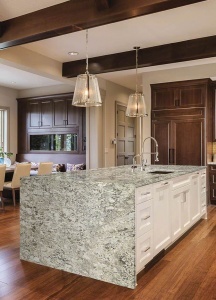 Most homeowners are familiar with quartz countertops, but aren’t as familiar with quartzite. Quartzite is a natural metamorphic rock that is produced when sandstone is subjected to extreme pressure and heat due to tectonic plate compression. This stone is mined from the earth and typically available in colors ranging from white to gray. Occasionally, you’ll find quartzite in other colors, which means that other minerals exist in the stone. Quartz countertops, on the other hand, are made using natural silicon dioxide and synthetic materials. While still mostly made up of loose quartz, these natural and synthetic materials are blended using a binder. Additional color can also be added to the mix to make these countertops available in a wider selection of shades. Should You Choose Quartz or Quartzite? Both materials have their pros and cons, which means that the final decision comes down to your preferences. When you start a bathroom or kitchen renovation project, it is important to discuss your options with your local home improvement services company. An experienced contractor will have worked with both materials and can offer you guidance based on your requirements and needs. As for the differences, quartzite tends to be harder and more durable than granite, but it is limited in color selection. Quartz is available in a wider range of colors since you can add pigments to the mix. Quartz also is also somewhat easier to maintain than quartzite, but the latter is easy to clean once it has been properly sealed. Granite Works can explain more about your options during our initial consultation. Here are just some of the samples of quartzite we sell. Granite Works is a local leader in natural and manmade stone countertops and custom cabinetry. We have years of experience, and we are dedicated to always exceeding our customers’ expectations. Let’s discuss your upcoming remodeling project today. Contact us at (301) 640-5010, or you can fill out our online form.